Sony Ericsson Sony XPERIA T (Latest Model) - 16 GB - Black (Unlocked) Smartphone. The 13 MP HD camera from Sony with full 1080p HD video recording captures it all in stunning detail. Combined with Sonys Exmor R sensor technology for capturing the best moments, even in low lighting conditions. And since the most unforgettable moments are often unexpected, you will be glad the fast capture camera goes from sleep to snap in just over a second. The perfect picture, the track your friend was asking about or even essentials like contacts and web pages. Forget messages and e-mail links. This NFC Android smartphone makes it easy to share content, phone to phone. Just hold your phone to another NFC enabled Xperia, and watch sharing magic happen. Just over a second from standby to snap and quick shot to shot capture with the Xperia S 12MP camera. Or shoot in crystal clear, full 1080p HD and share everything with your friends on Facebook or by email and text. 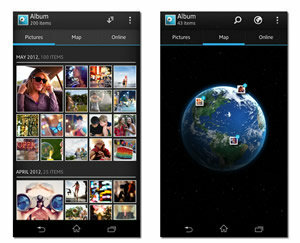 Flip through your personalised photo album - with the Album app you easily browse and share your photos and videos. Choose your most recent HD video, zoom in super-fast to see or browse the globe to find the pictures you took in Spain. Re-live it all on the 4.55 inch touchscreen with Mobile BRAVIA Engine. Your videos and pictures are crisp in every detail with no jagged edges or blurry faces. The original is back. Xperia T comes with the new Walkman app. Fill it with your playlists. get album art and artist info in the process. Just like magic. See what your friends are listening to using Facebook integration. Cant get enough? Go further with Music Unlimited and choose from millions of songs. When you have found the right track, crank it up with xLoud loudness enhancement, get it just right with graphic equalizers, and enjoy soul shaking clarity. Or connect to wireless speakers and use your phone as the ultimate DJ deck. If you want to share photos with friends, watch HD videos or play the latest video games on your TV, then Xperia T is the perfect product. Delivering perfect 1080p screen mirroring using MHL and HDMI out. Sony's TV Launcher app, makes your TV smarter and gives you a simple user experience. Sit back and enjoy this whilst using your TV remote to navigate through the menus. Feasts for film fans, masses of music. Enjoy a global catalogue of more than 12 million songs from Music Unlimited. Or download your favourite blockbuster movies from Video Unlimited. Its all on Sony Entertainment Network. With only one account you can enjoy everything on your Xperia smartphone, BRAVIA TV, tablet or PS3. No trips to the store. No late fees. Just pure entertainment. Get immersed in gaming with the PlayStation certified Xperia T. Download thousands of great titles for your Xperia smartphone from either Google Play store or the PlayStation Store. Just log in with your Playstation account and download original Playstation certified titles on your phone. The announcement of Xperia S is supported by the launch of three new Smart Extras accessories to enhance the experience on Android and to your smartphone. This Bluetooth stereo headset for Android smartphones offers multifunctional features in addition to superior sound. On the display of Smart Wireless Headset pro users can read text messages, see incoming calls, access calendar notifications and much more. When detached from the phone it functions as a standalone MP3 player and radio.